This morning we woke to another perfect Brisbane winter’s morning. Nice and warm (for winter) and the bluest sky you can imagine. Mornings like that make me want to leap out of bed and enjoy as much of the sun as I possibly can, particularly because I don’t have to longingly stare at it through my office window. So we took the dogs for their absolute favourite outing – going to the off-leash dog park where we let them run to their hearts content until they can hardly walk themselves back to the car. Seeing their complete joy is so heart warming. On the way back I thought, what can make this morning even more enjoyable and naturally food came to mind. 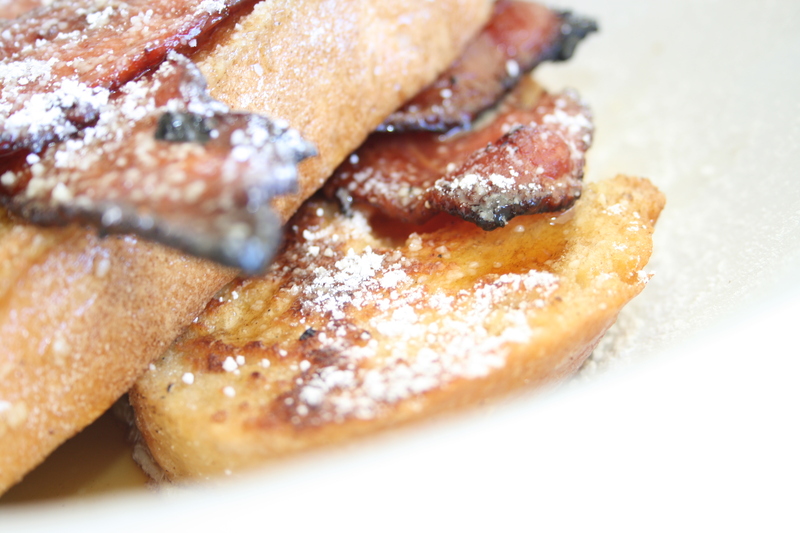 In particular French Toast. Yum. Last weekend my husband and I went out for breakfast to a local café, we both had French Toast and it was disappointingly average. I really love going out to restaurants and cafes, and never mind spending money on food, but one of my greatest pet peeves in life is paying for something I know I can make better at home. So today I did exactly that. 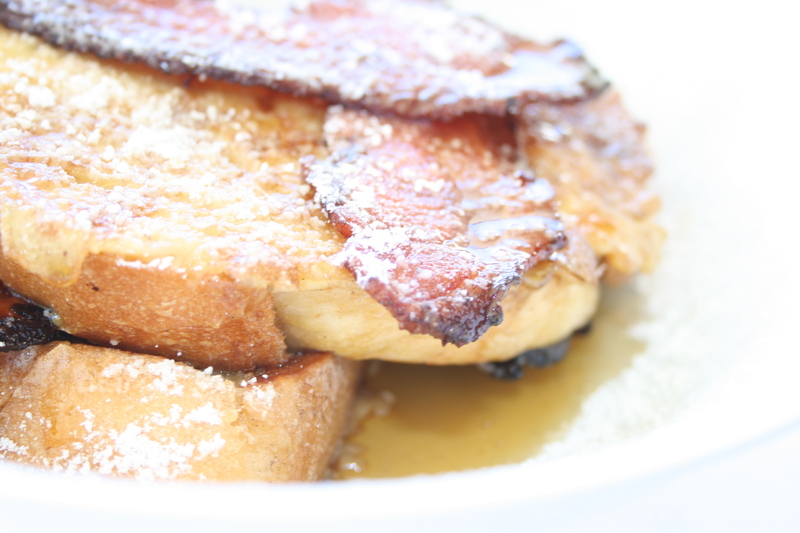 And dishes aside, making French Toast at home really isn’t hard work, nor does it take long. With the biggest added bonus, I can make it exactly the way I love it. One thing my husband and are totally divided on, is fruit on French Toast, he doesn’t want anything else on there apart from bacon and maple syrup. Whereas I love any kind of fruit on it, today I just couldn’t resist fresh plump black cherries. I always add a little bit of vanilla paste and a pinch of cinnamon to the egg mixture because it tastes amazing. And with the bacon, I brush a bit of maple syrup on each rasher before popping it under the grill in the oven. It doesn’t make it taste overly sweet, but it does make it nice and crispy and a little sticky. With the cherries I stew half it for a few minutes on the stove with some cornflour to make a a thick cherry sauce. So I made one serving of French Toast with bacon and the other with the cherry sauce. And served with freshly juiced orange, pineapple and grapefruit, I could not have hoped for a more delicious brunch! Turn on the grill element on the oven. To make the maple bacon: lay the bacon rashers on an oven tray and using a pastry brush, brush each side with the maple syrup. Pop under the grill for about 5 minutes and turn over and repeat. To make the cherry sauce: halve and pit half of the cherries, combine the cornflour and water in a saucepan and add the cherries. Cook over medium heat for no longer than 5 minutes. I crushed a few of cherries to release some of their beautiful juice. 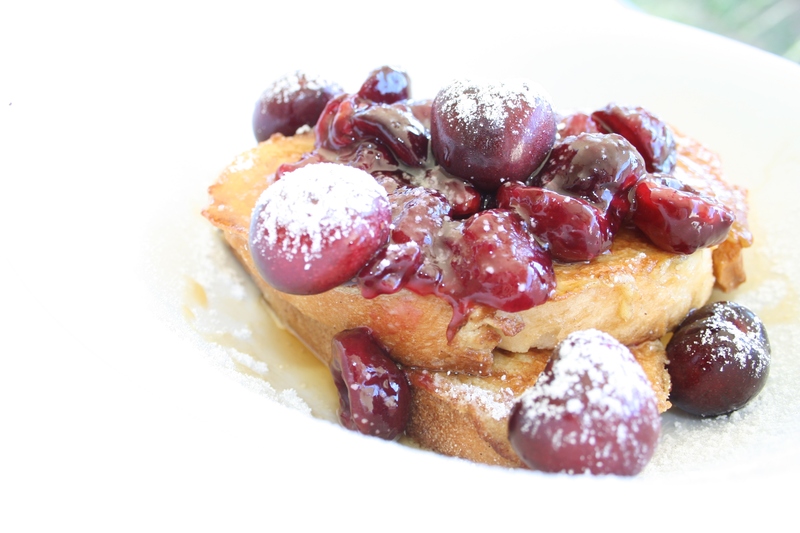 Retain the other half of the cherries to scatter over the toast when serving. 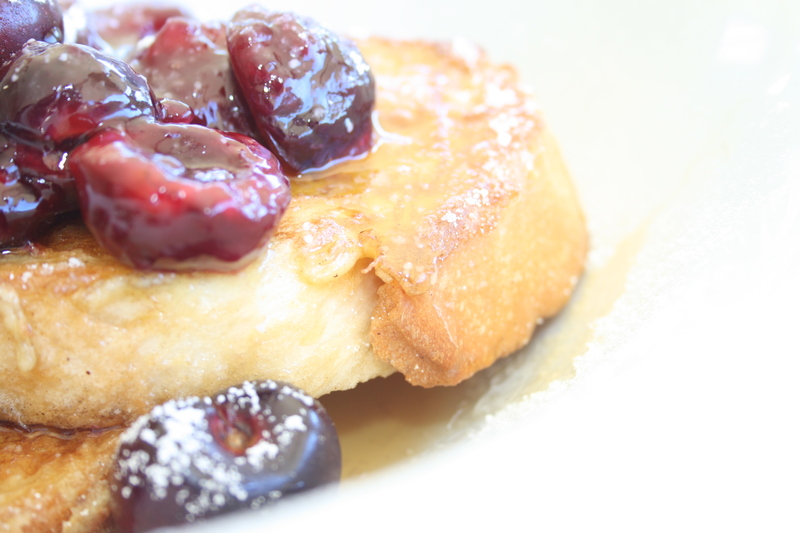 To make the French toast: pre-heat a frying pan to medium heat and melt the knob of butter, whisk all the remainder of the ingredients together and dip each slice of bread into the egg mixture and place in frying pan. Fry until golden on each side. Serve straight away and drizzle with maple syrup. I like the way this whole thing sounds. oh my gosh – if i wasnt reading this just before dinner, I would have been making this immediately! I agree – I can’t justify spending money on something that I could make at home. I don’t really understand when people go out for breakfast just to get porridge or scrambled eggs on toast! Thank you 🙂 I know…I always try something that I would not really make at home. It’s nice finding places that have something different on the breakfast menu other than the normal stuff!